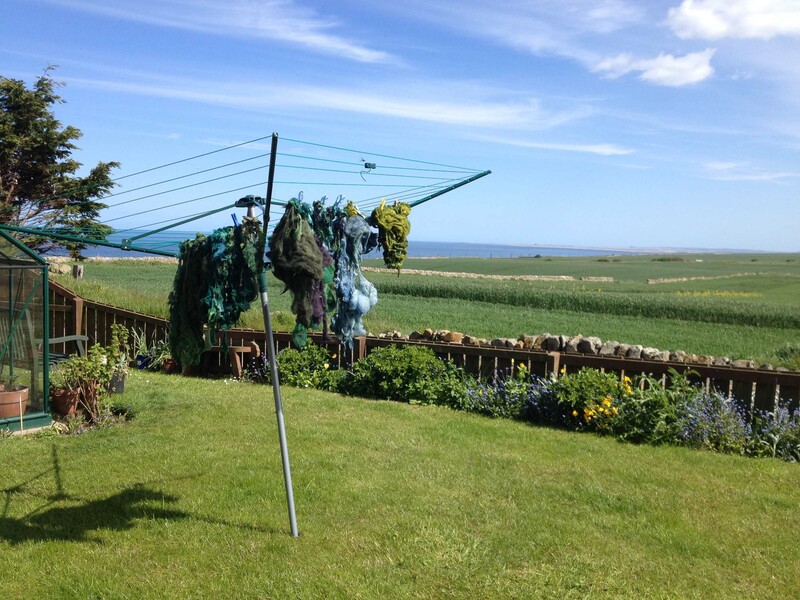 Most spinners will recognise that uncomfortable moment when their partner remarks “And is that all the fleece you have? Really? Promise?” Crossing every digit, you mutter “yes, of course“, knowing full well there’s another stash buried deep in a little-visited cupboard upstairs. 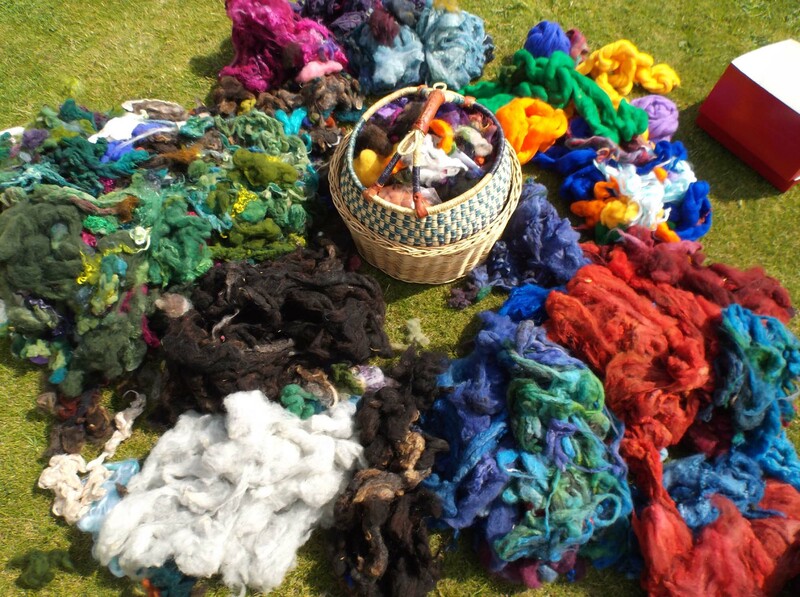 Well, here is my coloured fleece stash – and yes, I promise: this is all of it! Honest. 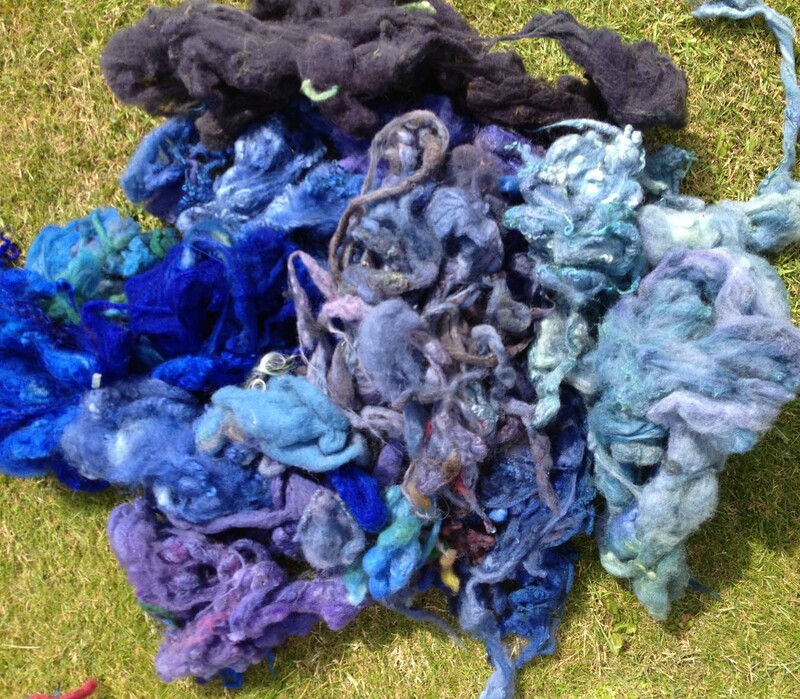 A full coloured fleece assessment was called for yesterday as I checked over my spinning projects. 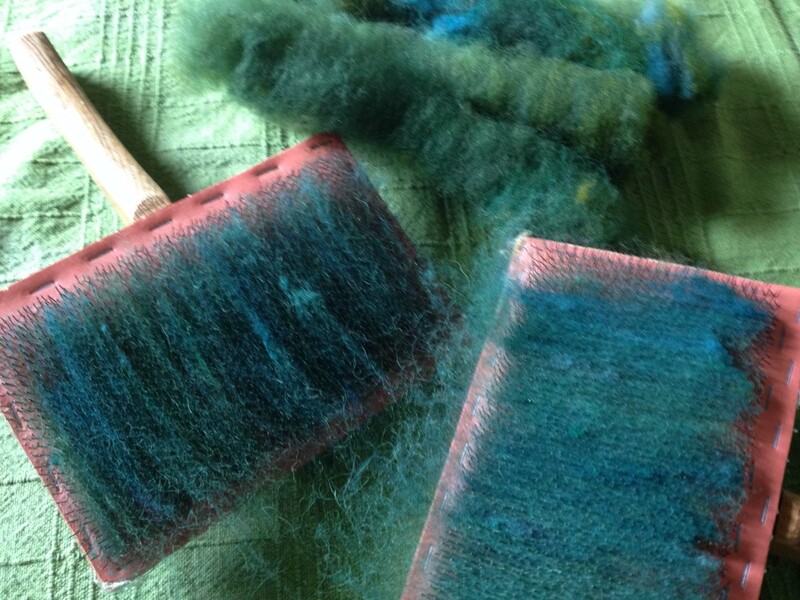 Earlier this year I’d decided the time had come to dye some more fleece. It was spring, and my palette was strongly influenced by the colours of nature. 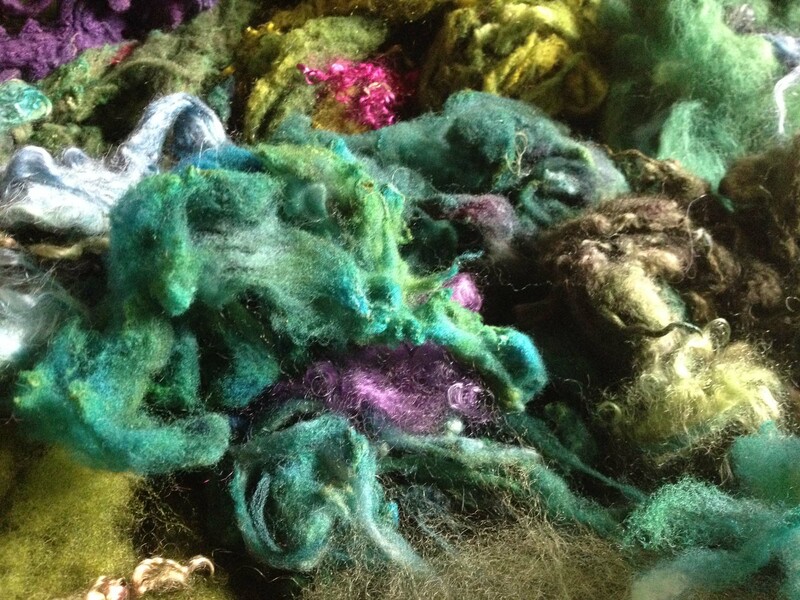 Up close and personal, as the wet fleece begins to dry you can see what gorgeous colours these are. A little bit of acid lime to pep it all up. I couldn’t help letting a little bit of fuchsia creep into the dye pot. I had it in mind to knit a cardigan for myself. I was very taken with Julia Farwell-Clay’s Tambourine (which appeared on the front of the Spring Issue of Pom Pom Quarterly). I love the rondels on front. Withstanding all the temptations of amazing indie yarn producers, I was determined to spin the yarn for this cardigan myself. After all, I had all this fleece, and I loved spinning. What I found I was doing was spinning odd little hanks that weren’t really enough for anything much. Yes, they would work for the odd scarf, but I really had enough of those. 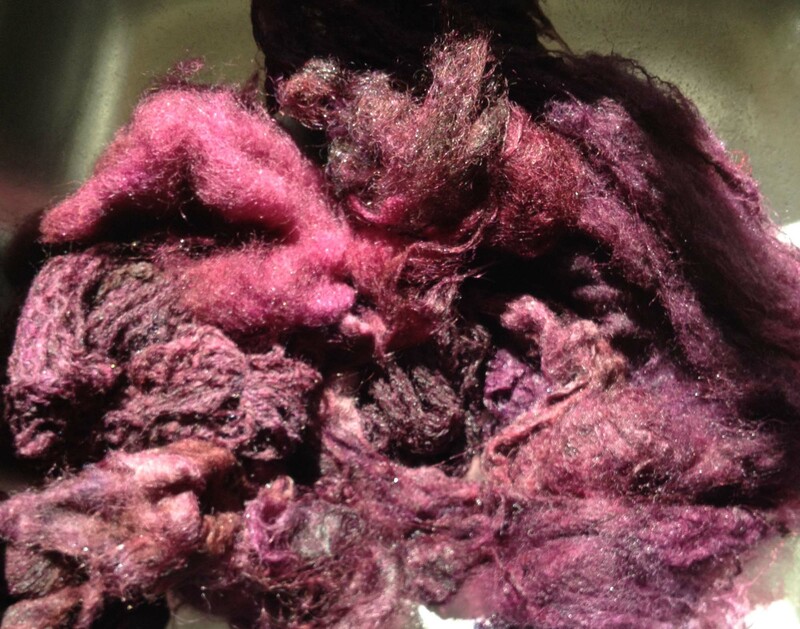 So, I assessed my fleece … did some carding … and got spinning. 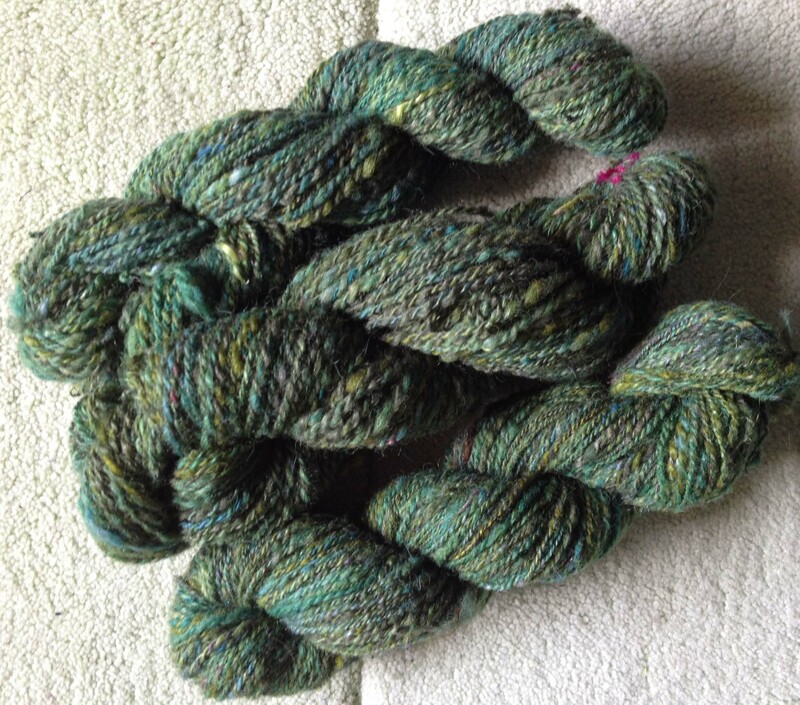 Here’s the product: some lovely variegated green yarn. I wasn’t satisfied. Let me explain. It looks lovely as hanks, incorporating all the flecks and variegated colourings that I like. 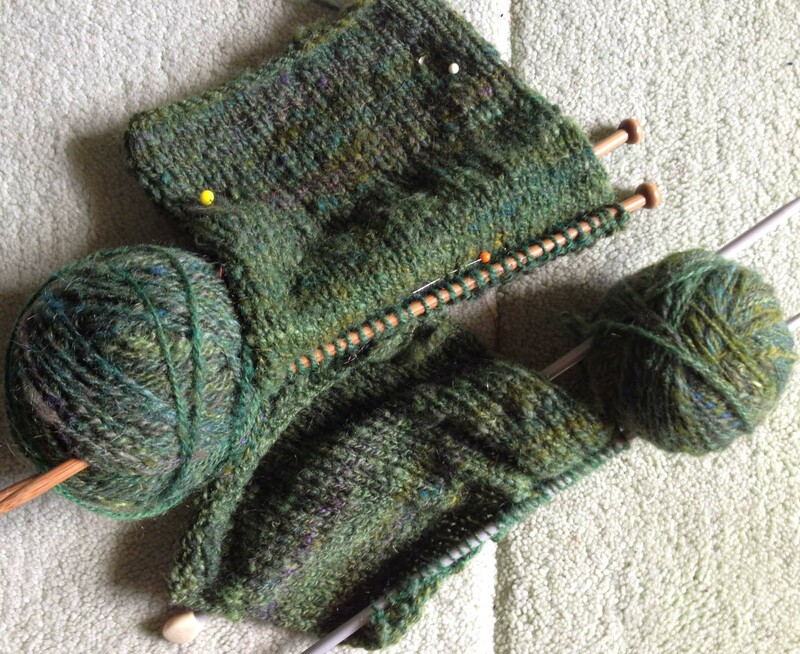 But when knitted, it was rather dull and muted. If you go back to my fleece “puddle”, you’ll see why I was disappointed. Look at that glorious top note green on the top of the pile. It’s being swamped by the darker greens lying below. 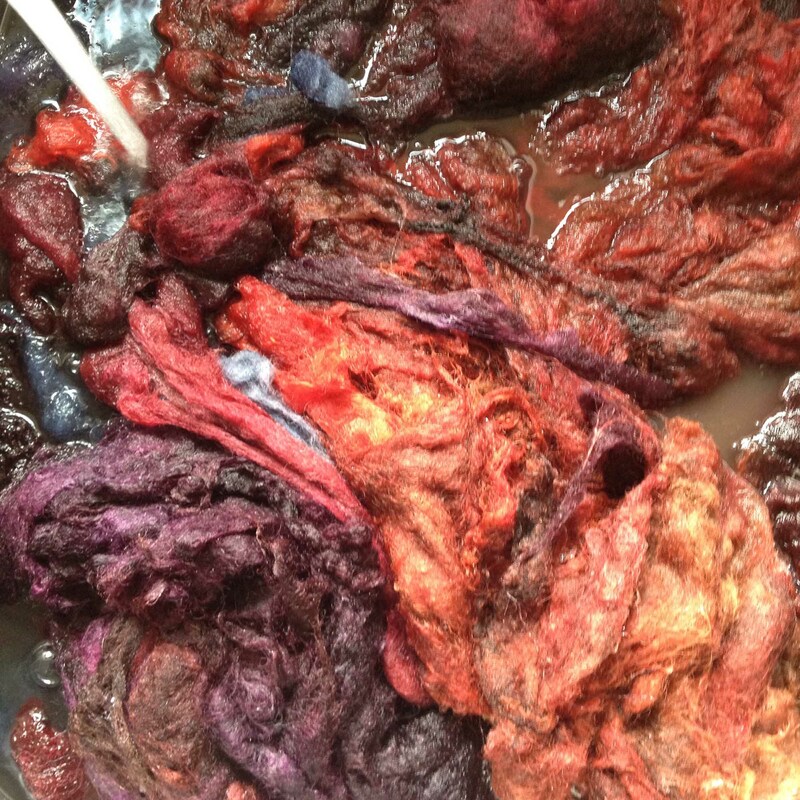 Back to the drawing board…err, dye pot. And a completely different colour palette. 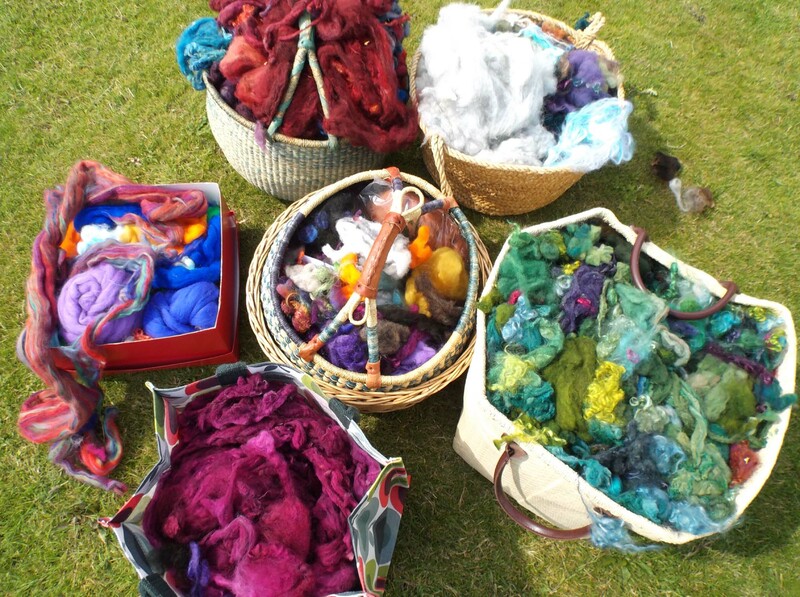 All these yarns (and they encompass wool from Shetland, Jacob, BFL and other sheep, mohair, silk) are rainbow-dyed using acid dyes. 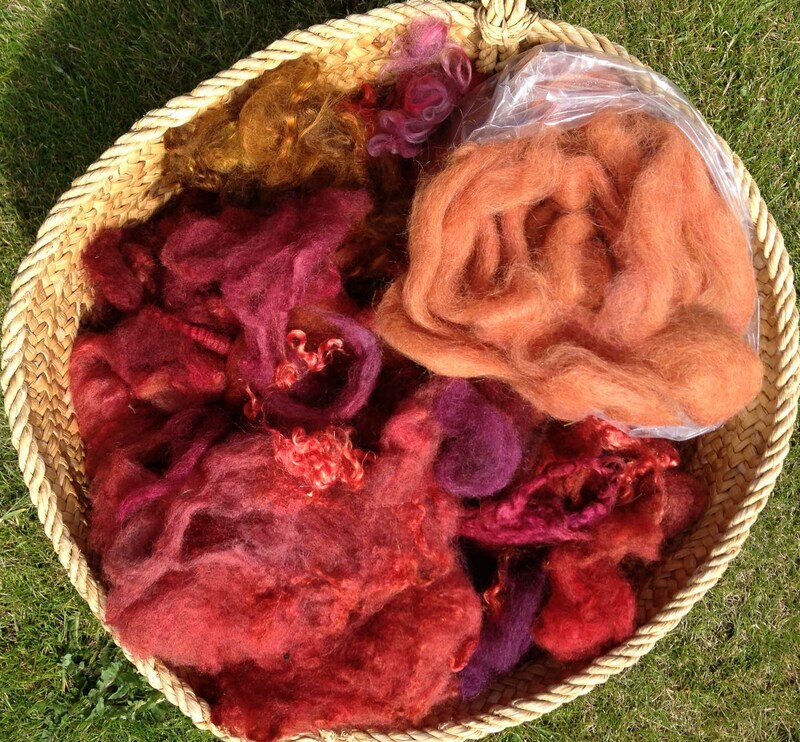 You can now purchase excellent small dye kits which are complete in themselves (in the old days you used to have to add vinegar, washing up liquid, levellers etc). And modern acid dyes are very safe – I wear a face mask, rubber gloves – and I clear all food stuffs from the kitchen before I start. In recognition of the possibly undesirable effects of the exhaust, I pour as much of it as possible into the ground. 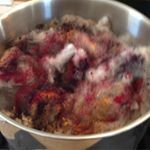 It’s not a small undertaking, so I set aside a day for dyeing and will dye at least half a fleece at any one time (making successive dyepots, reusing the exhaust from the previous dyepot). My first dye pot and I got berry colours – nice, but a bit darker than I wanted. Next lighter redder, orangier colours – very pleased with this, but a bit taken aback when folk greeted my instagram pic with the statement that it looked like body parts! Wonder what you think? Finally some blues as well. Now, lets go back to where I was at the beginning of this blogpost. A fleecy assessment. When you pull the fleece out of the baskets and boxes and bags, you realise just how much coloured fleece I’ve got here (this is a very honest post). This fleece has come from a lot of sheep! It looks even more abundant when I start to make plans and move this gorgeous stuff around. I have several projects in mind. First, I’ve decided to try spinning some blue yarn for the Tambourine cardigan. 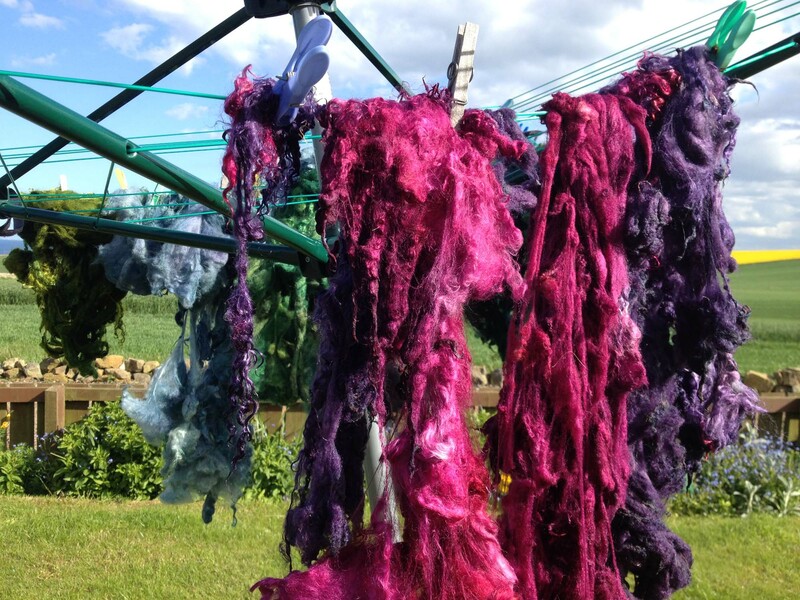 Secondly, I’m putting together some nice brightly coloured fleece to take to spin when I’m demonstrating with the Tweed Guild of Weavers, Spinners and Dyers at the Border Union Show near Kelso at the end of this month. 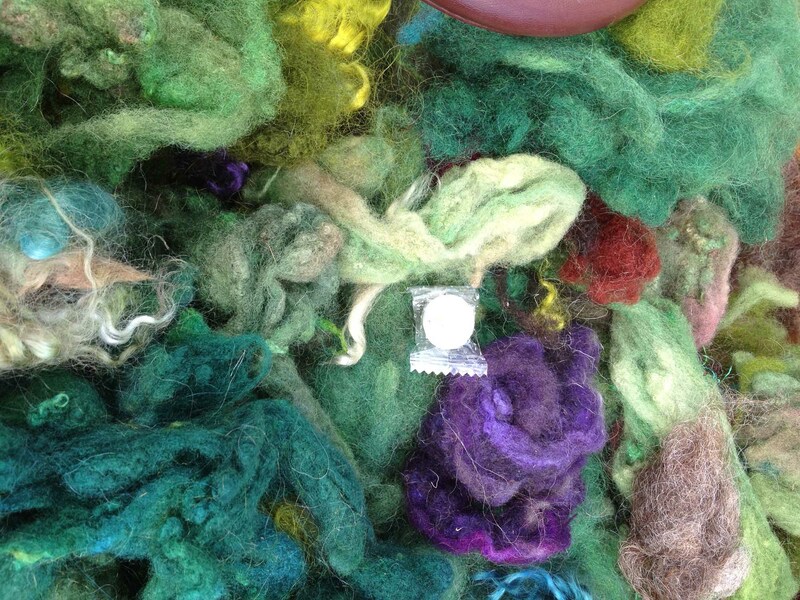 Last year I took some fuchsia fleece and it was a great success with the young beginner spinners. This is what I’ve come up with for this year. I’m very taken with the orangey/scarlet/red tones that I’ve dyed so I’ve allowed myself to put a little bit aside for some comfort knitting this winter – I’ll probably end up with just a few skeins that will make a nice scarf. Doesn’t it look cosy in it’s basket? 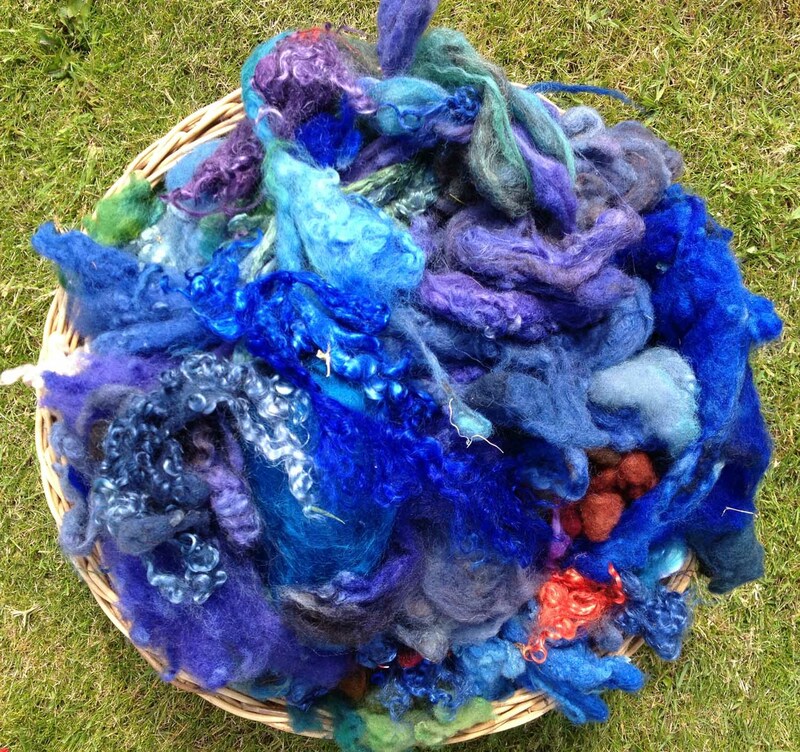 I’m also very excited to start spinning the basket of blue fleece. Hmm – I’ll have to think this through – shall I card, or just spin? Perhaps a bit of both. The difference is that carded fleece will give me gently variegated colours. If I just pluck the yarn from the basket to spin as is, I’ll get much more sharply contrasted colours – and you’ll see I’ve added some red and green mohair for sparky little contrast. I’ve already started to spin the fleece for the Border Union Show. It looks great! The rest of the fleece gets packed away in the baskets for other projects other days. There are colours in my bags and boxes that are leftovers from ancient projects that I worked on a long time ago. I’m always careful to make the fleece unappetising to moth before it gets packed away. 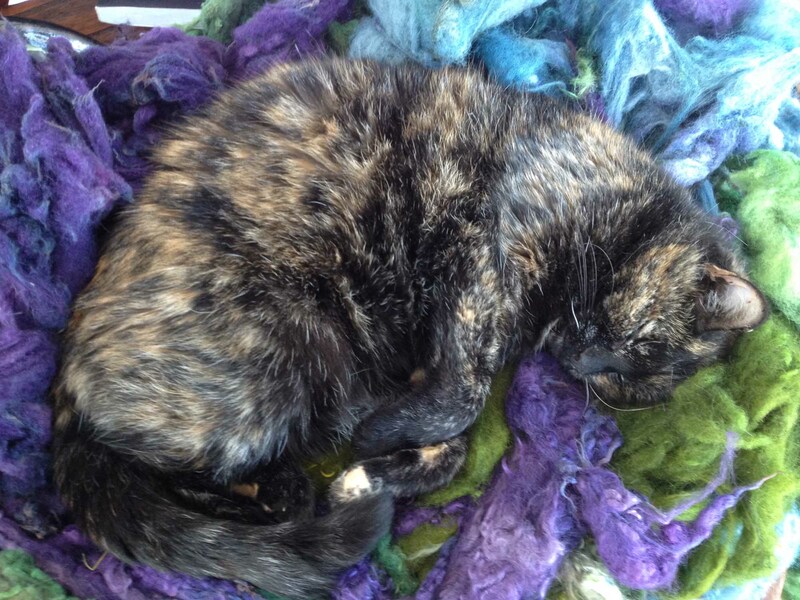 But I’ve left some fleece out for the cat to enjoy for a bit. Woweeee! How marvelous. 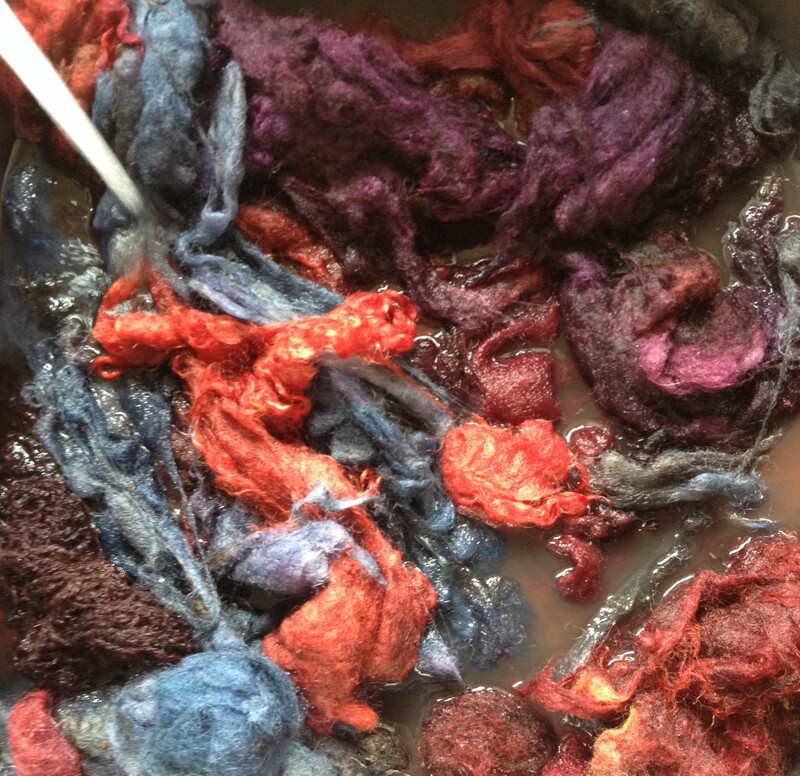 This kind of spinning and dyeing is so far out of my comfort zone! But it looks so expressive, so exciting. I can see why you got into Kaffe, you just love all the colours! 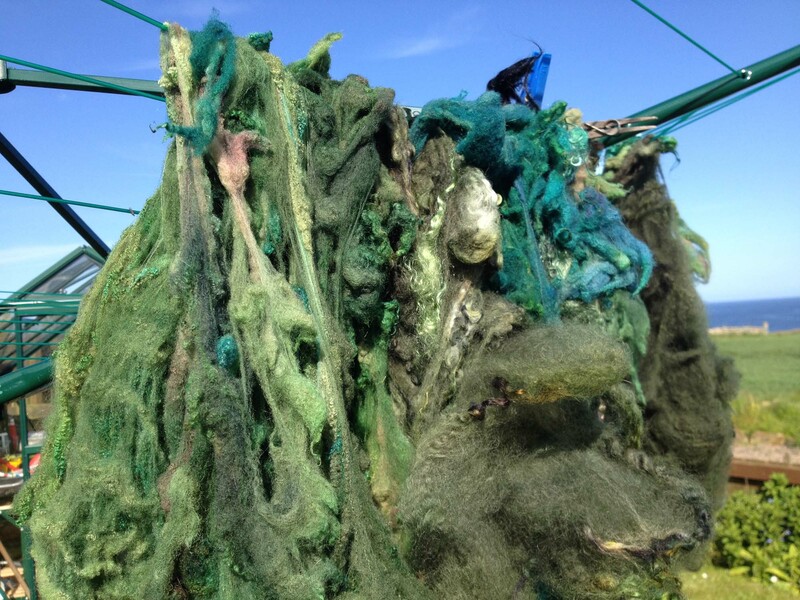 I could imagine core spun art yarns coming out of one of those baskets. I definitely need to give this kind of spinning a go. It looks like it would bring on an epiphany! Darn, Rebecca got here ahead of me 🙂 I LOVE all the colours! 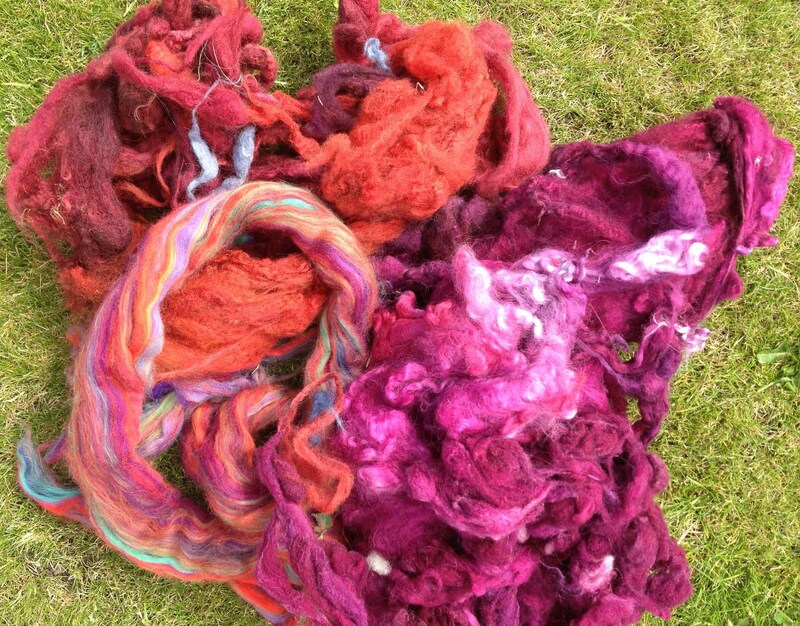 When I read the comment re the red dyed wool I had to laugh…Depends on your outlook! I adore the poppy sweater and your blanket is FUN! What a good idea. And isn’t Poe just the luckiest cat. Your work for the Border Show is lovely. Aren’t the colours fun, Susan?! – that’s what craft should all be about: having fun, enjoying yourself, exploring different avenues……even boiling up woolly guts! I assure you, Rebecca, it is great fun – and so easy. Yes: you’ve definitely got to have a go! Overcome as often by the prodigality of your creativity! Really wonderful. Would love to see you spinning when I come. I don’t think I was one of the ‘body part’ responders but did think at the time that red dye bath looked like one of the bits in Holby City where I close my eyes…….. But spun and knitted, a different story! All looks so beautiful. I’d love to show you my spinning, Polly! It’s such a comforting, pleasurable pursuit. I promise you those “body parts” will look positively beautiful when I’ve finished with them! 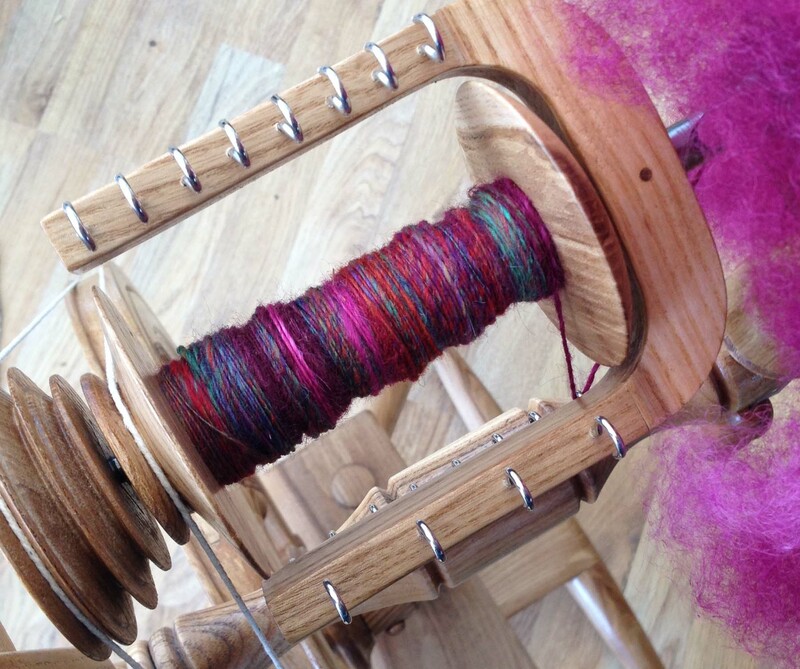 Spinning is not a craft for me and dying yarn … well I really don’t need another craft. But to see another create such beautiful pieces is so inspiring. 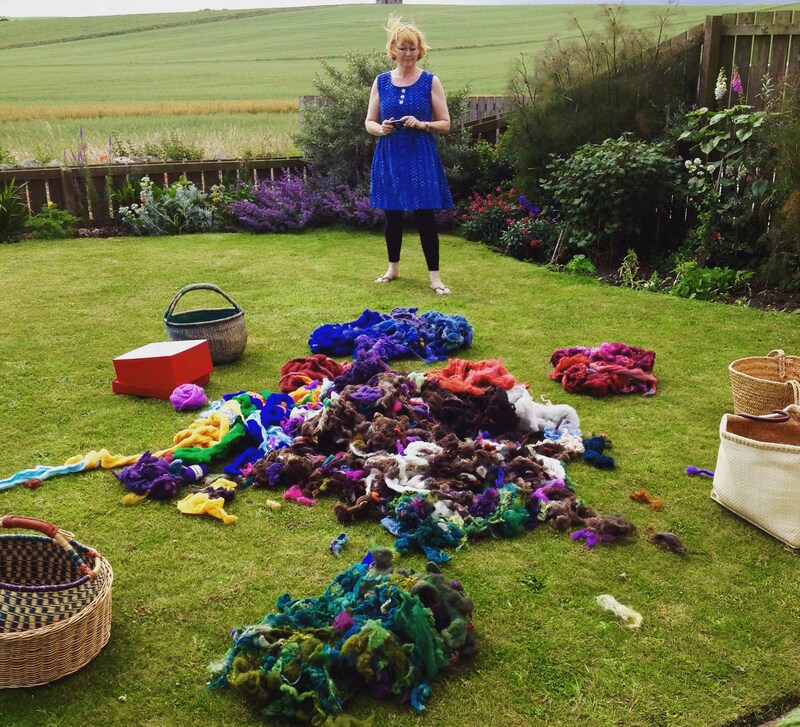 Oh, I can so completely identify with that feeling that there is no space for another craft in your life – that is just how I feel, and however tempted I am by weavers, printers etc, I’m very chary of giving in to them! I’m glad you’ve enjoyed watching my spinning and dying – perhaps one day you’ll be tempted to try them….?! You’re quite right – you can see why it’s much easier to go out and buy the stuff! I love all the colours! 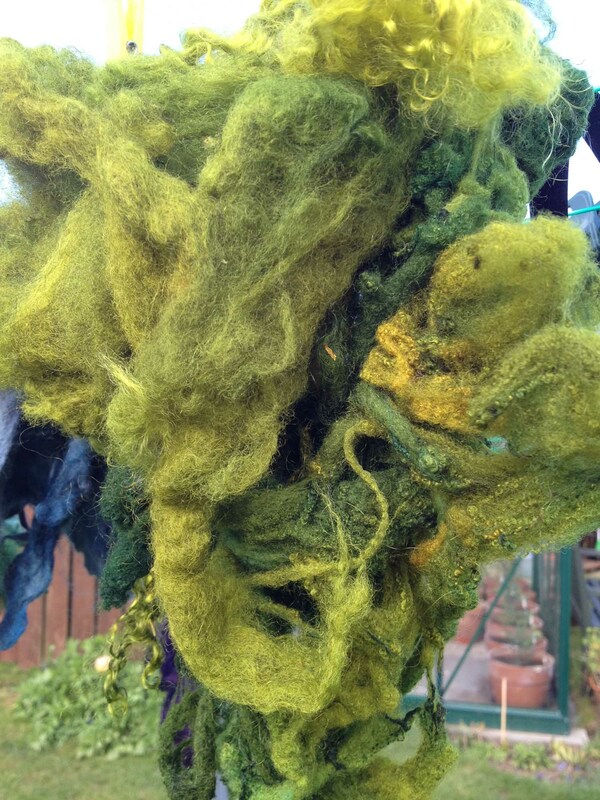 It’s a wonderful alchemy, dyeing fibre 🙂 I think you did a great job, and even if you don’t like how the greens were knitting up, it’s still a valuable lesson. Thank you! – I’m glad you like it, but you can see why I am so impressed by your careful measuring – I ought to try and do it one day like that. 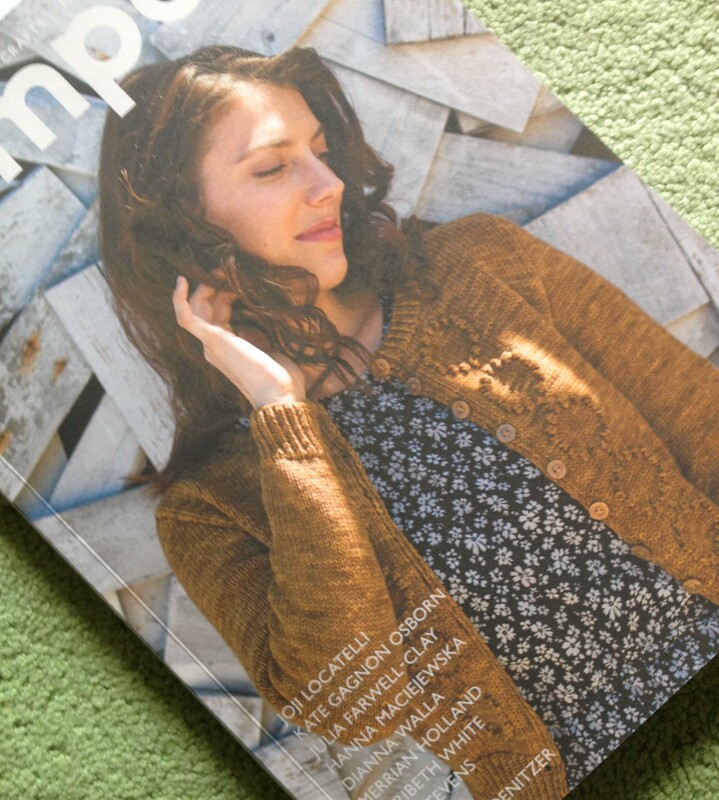 8 fleeces….hmmmm – lucky you!